With the Seattle Mariners recent contract extension of Kyle Seager and free agent signing of Nelson Cruz, it seems that the fantasy prospects of Robinson Cano are under the radar. 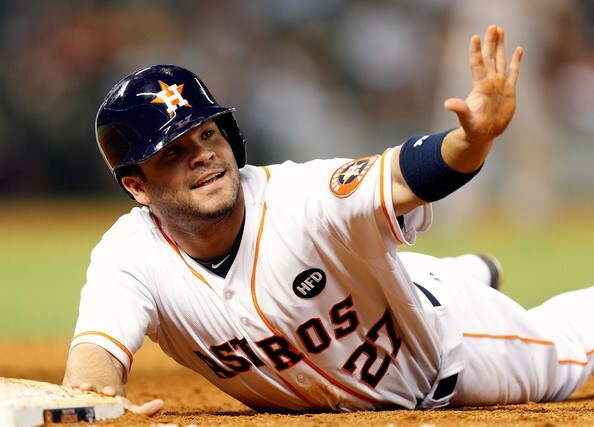 As the 2015 draft season approaches, this may create a unique buying opportunity on one of fantasy baseball’s most consistent performers at second base. Robinson Cano entered the 2014 season as the 11th player taken in live drafts according to Fantasy Pros but whether it was ballpark effects or the lack of support in Seattle, he had his worst season for fantasy purposes in years. Not only did Cano finish outside the top 30 on the ESPN Player Rater (32nd to be exact), he finished 5th for second baseman. What has made him a first round stalwart is the fact that you could count on his batting average and power at a position where it is rare to find both of those qualities. But Cano carried over his second half HR/FB% from 2013 of 10.3% in New York with him to Seattle where his HR/FB% for 2014 was a career low 10.7% on the season. 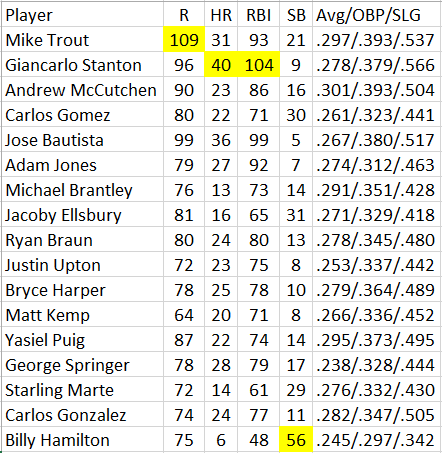 Over the last 2 seasons the OPS of the players batting after Cano is .687 and .647 respectively. In spite of this, Cano’s average OPS over the last 3 seasons is .904 and only dropped to .836 in Seattle despite the depressed ballpark effects for left-handed power. According to Fangraphs.com, Safeco Field scores a 99 for ballpark effect on left-handed power. Conversely, Yankee Stadium scores a 117. 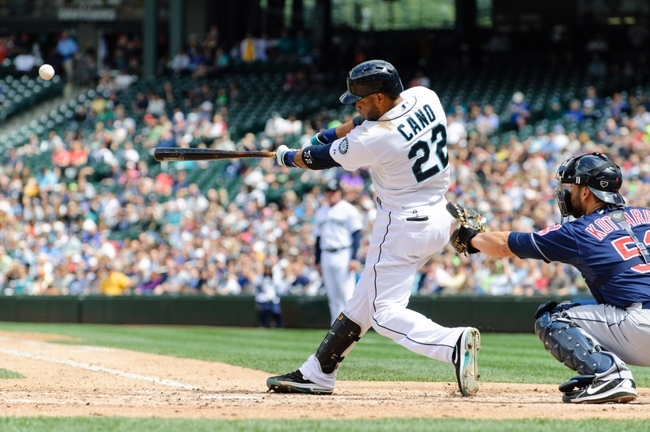 In order to figure out where Cano’s power has gone, we need to look deeper into the numbers. Eeven though the fences at Safeco were moved in and lowered, Cano is hitting fewer pitches for power to the alleys. In 2013, Cano hit 8 homers to right-center and four to left-center, but in 2014 he only had 1 to each of those destinations. 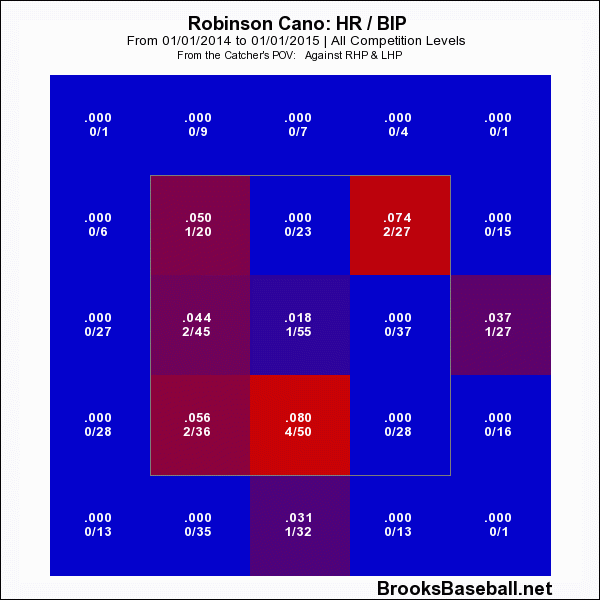 Cano hit only 3 fewer home runs to right field and had the same to left so those were small differences. 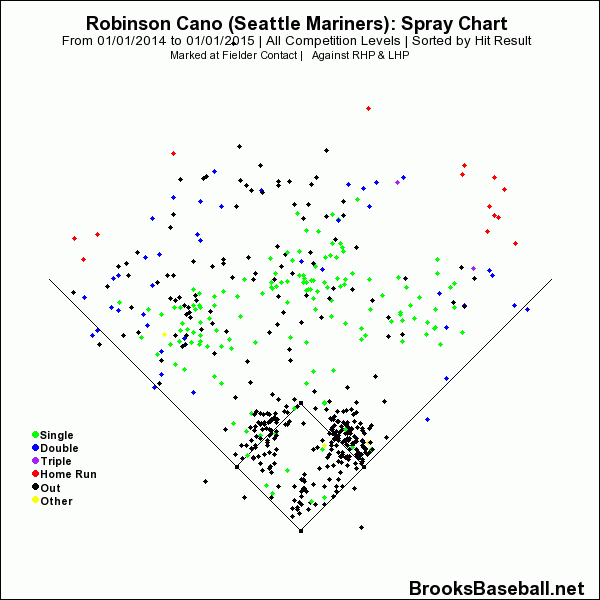 In 2013, Cano hit one-third of his home runs in the bottom third, middle part of the strike zone. 9 of the 47 balls that he put in play in that zone found the seats. 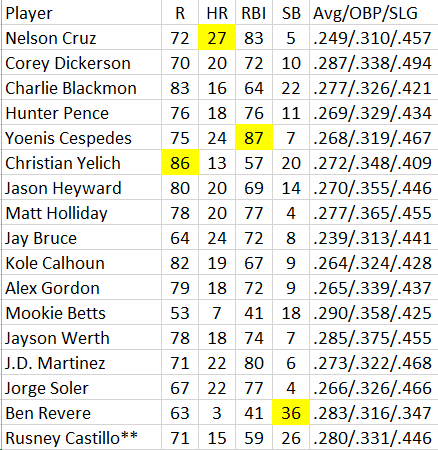 However, that same zone had more balls in play (50) but the home runs were cut in half to only 4 for the season. 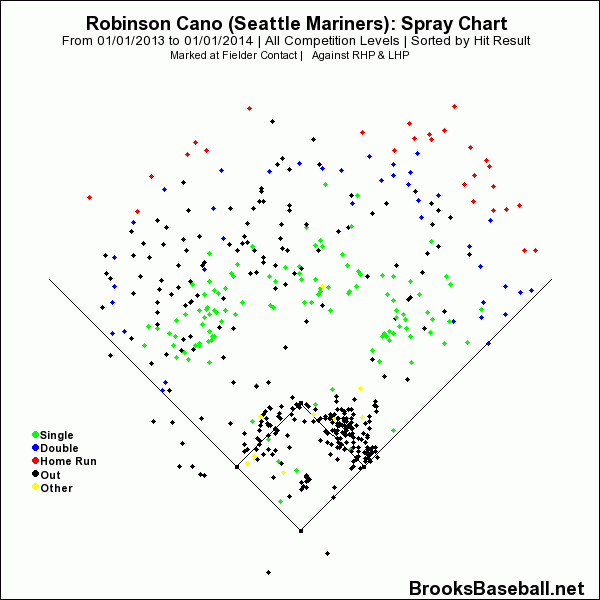 In fact, over the lower third part of the strike zone, Cano lost 5 home runs in 2014. It also seems like Cano really missed driving the ball to left-center field as he hit 10 home runs on pitches to the outer third of the strike zone in 2013. That total was also cut in half in 2014. Despite his line drive percentage dropping the last 3 years, he has maintained his batting average. His swinging strike percentage further punctuates that as it has gone down the last 2 years and has lowered his career percentage. Since weighted runs created evens out ballpark effects it is a useful statistic. The league average is 100 and the move to Seattle only dropped Cano’s wRC+ by 6 points, but that is a result of the lineup surrounding him as much as any ballpark factor. 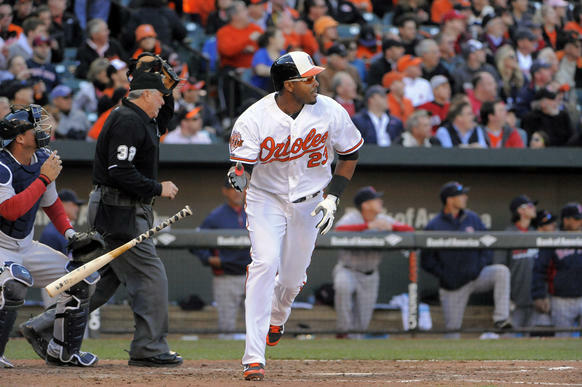 With the additions of Austin Jackson and Nelson Cruz already, this should rebound for Cano moving forward. What fantasy owners should be most worried about is the steep drop in home run to fly ball ratio which has been cut in half since 2012. Due to his ability to hit for average and drive in runs, if Cano can return to 20 or more home runs, then his return to fantasy prominence in 2015 will happen. But there is an “if” attached to that. 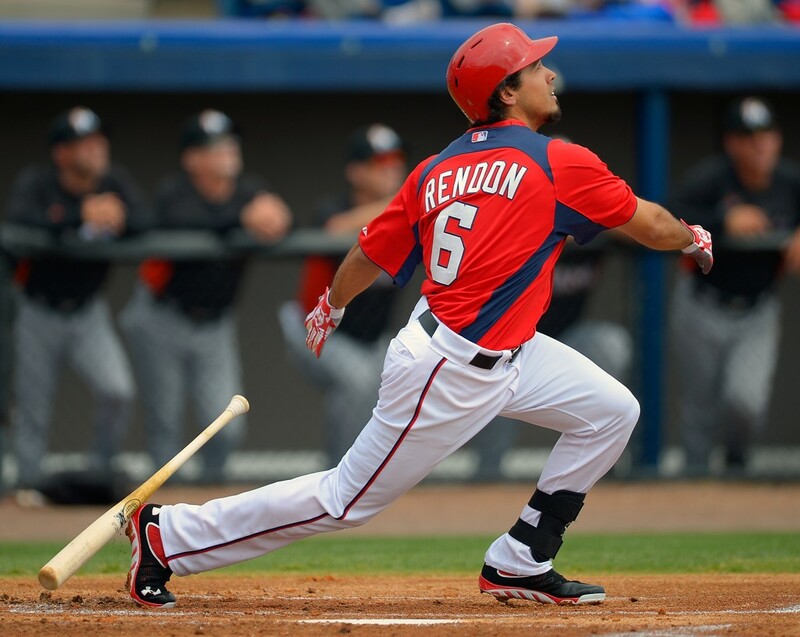 Seattle finally gets a right-handed power bat, but did they pay for a career year? Seattle has to try and placate not only their fan base, but their franchise investment, Robinson Cano. 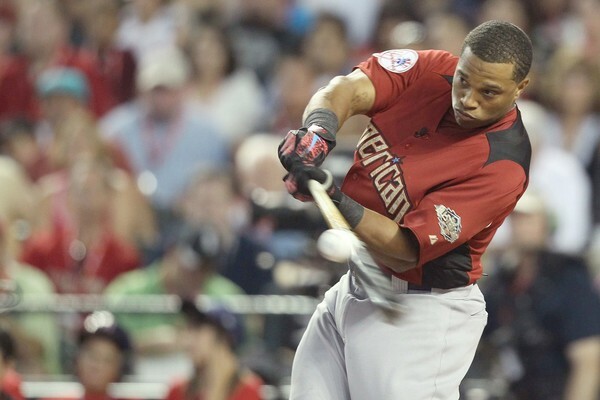 Everyone knows that Seattle needs a right-handed power bat to balance their lineup and protect Cano. But did the Mariners overpay at 4-years and 57 million dollars? Only time will tell and it will be dependent upon if Seattle can win a World Series within this window. With King Felix and a young crop of starting pitching arriving, now seems like the time to go for it. 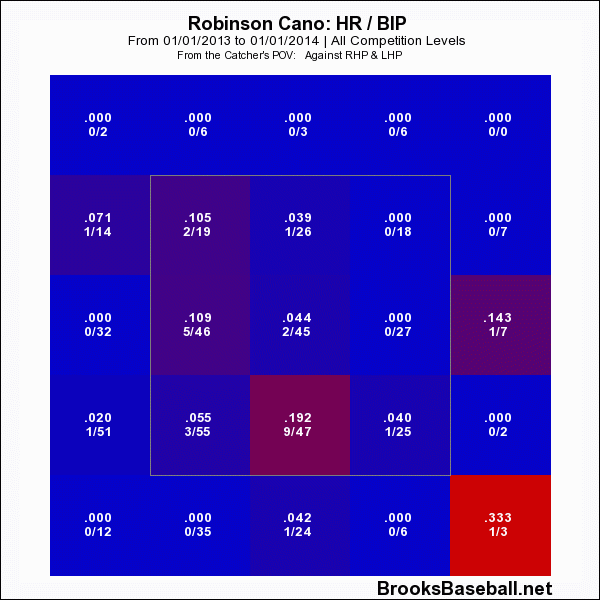 Not only is Cruz a key to improving Robinson Cano in 2015, but there are some eerie similarities between the two. Cruz saw a drop in production after the All-Star break in 2014. However, in comparison to the numbers above, even his worst half of the season trumps either of the statistical lines above. Will Cano bounce back in 2015? It was only a year ago, but I really did not remember how good of a first half Cano had in 2013 and he almost matched Cruz’s first half in 2014. One of the inferences that stat people will point to is that Cano’s HR/FB% in the second half of 2013 dropped to 10.3% from 21.6% in the first half and it carried over into 2014, as Cano’s full season HR/FB% dropped to 10.7% in 2014. Much will be made of the ballpark but Cano’s second half of 2013 was with the Yankees. Nelson Cruz’s first half HR/FB% was a robust 23.9% and dropped to 15.2% in the second half just under his career number of 17.3%. So before I attempt to predict what Cruz will do in 2015 in Seattle, I need to go back a step. Please remember Cruz’s 2014 second half and Cano’s 2013 second half as a frame of reference. That tweet was no joke, Cano lost only two MPH on his average speed of the bat but that accounted for a drop in average home run distance of over 20 feet in 2014. It is going to be difficult to say the same will happen to Cruz but his margin for error may affect his home run totals. Complete reversal, right? To set a baseline for Cruz I will use his three-year game average of 142 games, though acting as DH should keep him healthy. Based on the second half, his counting stats over 142 games would be 66 runs, 26 home runs and 73 RBI. Not a bad start to set a projection at. If he kept that pace and did get to the 159 games he reached in 2012 and 2014 then the numbers jump to: 75 runs, 29 home runs and 82 RBI. I am willing to split the difference. What I’m most interested in is whether Robinson Cano can bounce back. Since his disappointment in 2014 will provide a buying opportunity, I am willing to reach for Cano this year when I avoided him in drafts last year. 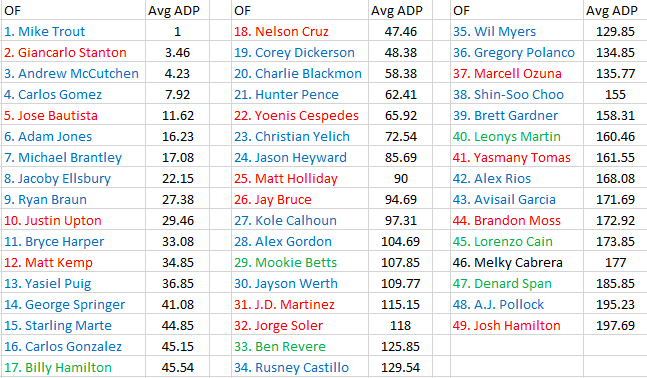 It has been 2 years since Cano had a capable player batting behind him, and though Nelson Cruz has his warts, he represents a huge improvement as protection in the lineup. 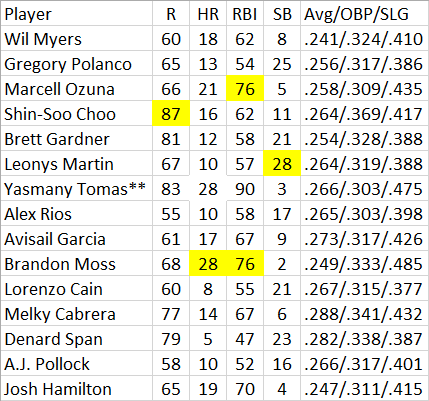 If Austin Jackson and James Jones can get on base, the Mariners offense will be vastly improved. Corey Kluber vs. Detroit Tigers – Kluber in his last outing against the Tigers = 8 2/3 innings, 2 ERs, 10 Ks & 1 BB. Consider yourself warned if you don’t start the man, you won’t be making money today. Song of the Day – Stay With Me by Sam Smith – Such a fantastic well written song. Smith’s voice could really bring Sunshine on a Cloudy day. Haren has a road ERA of 5.11 this season. LHH are hitting .303 with 8 HR and 37 RBI against Eovaldi in ’14. Madison Bumgarner vs. Philadelphia Phillies – Even though he has struggled over his last few starts, Bumgarner has a 1.94 ERA on the road and the Phillies, well, just aren’t very good at baseball. Movie of the day: Lucy – I got a chance to see this last night and you know what? It wasn’t as bad as I thought it would be, but wait until it comes out on DVD until you check it out. Good Morning! Baseball is back! It was a rough couple of days for us DFS players. 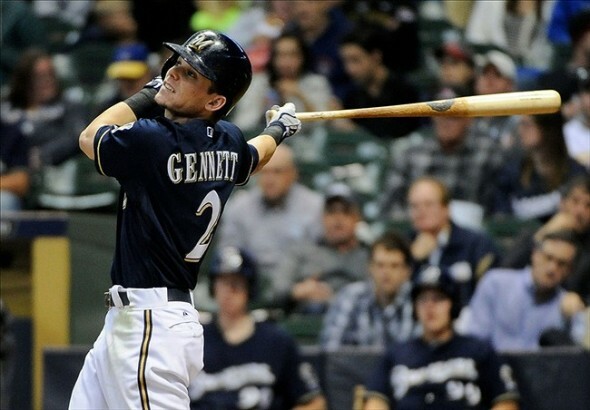 Maybe you found yourself dabbling in DFS golf or betting the Home Run Derby. Today, I re-launch my daily DFS plays. 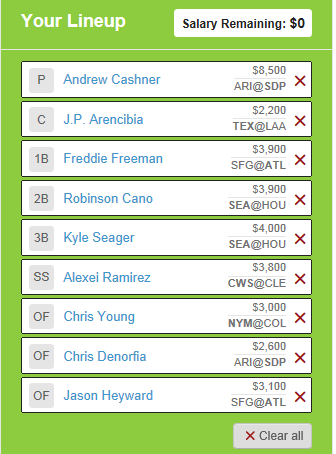 I’ll outline my favorite hitters for the day as well as my top pitching option. Check back frequently, as I’ll have this live every morning! Stanton is hitting a cool .370 this year against LHP. Werth is one of the hottest hitters in baseball right now with 6 HR in the month of July. He’s got a great matchup and should be in all lineups tonight. Weaver has given up 11 dingers to opposing lefties this season. Bauer has given up 9 homers this year and 5 of those came in 2 starts against the Tigers. Colon was fantastic in his last outing against the Padres and they have one of, if not the worst offense in the NL. Love big fat Bartolo today.